‘Let the good times roll’ a phrase that Kawasaki use as their marketing catch actually lends itself very well to the new 2013 naked street fighter from the Japanese manufacturer. Kawasaki firmly established themselves as a dominant name in the naked street fighter market thanks to the Z750, and now it’s replacement has arrived. From an aesthetic view point, the new Z follows on nicely from the previous model, keeping the same aggressive styling traits mixed with modern detailing making the Z a real head turner. Stop at the mall for a moment and onlookers will approach you to find out more. Styling details include beautifully crafted headers that worm their way out of the front of the bike letting everyone know you have 4 cylinders. The rear LED tail light is modern and clear, the sharp under cowl paired with the engine shrouds finish off the appearance giving the Z it’s expectant aggressive stance. Onboard the Z you get a natural riding position perfectly suited to everyday commuting or weekend mountain pass blasts. There is a full digital dash which has a unique rpm gauge that is located in the middle of the screen. 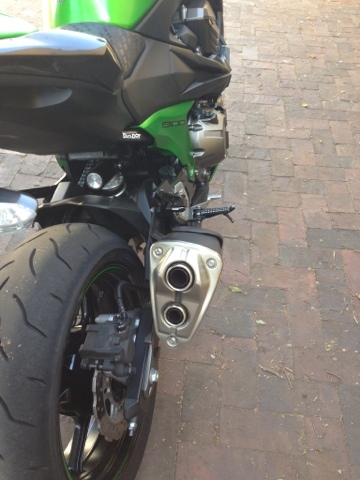 The brakes are fantastically responsive and have the wavey discs found on Kawasaki’s of late. The wide handlebars allow the rider to throw the Z in any which way you want giving the bike a very responsive feel, perfect for road riding. The Z is an entertaining bike to ride but with the standard exhaust pipe it is exceptionally quiet and restrained, I think we have the insane emission regulation standards to thank for that. However from an ergonomic perspective, Kawasaki have outperformed themselves once again bar the crunchy gear shifter which I feel could be a littler more supple. The 4 cylinder 806cc powerplant has a fantastic torque delivery and plentiful power for the road, the figures read 83kw (113hp) and 83nm of torque. The pillion seat as well as the riders seat is comfortable allowing for extended road journeys without much cramp. The kick stand however is slightly hidden away forcing you to do the splits to locate it, this would be ok if I were a pole dancer, but unfortunately I am not. 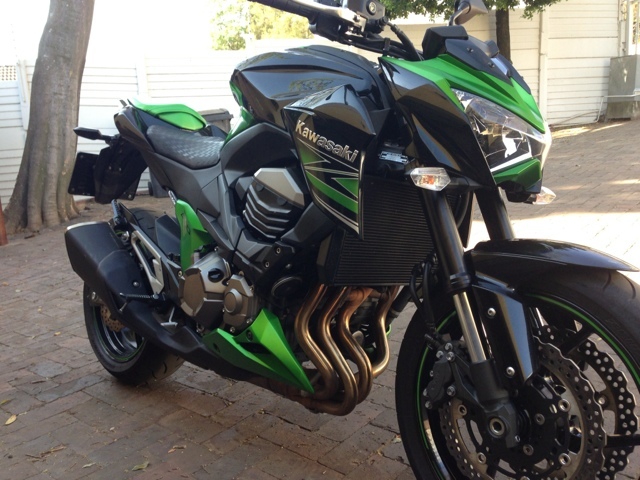 The good news is you don’t have to be a pole dancer to afford the new Z800, at around R115 000 in South Africa, it is not badly priced at all. ABS is an option on the Z but that is where the electronic gadgetry ends. 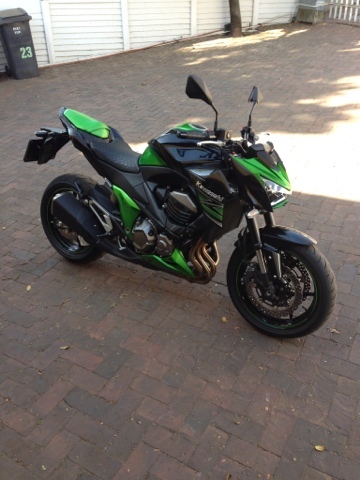 There are no riding modes, traction control, or quick shifter, some would say that is preferable for purists, others would say kawasaki will lose sales to competitors who incorporate these rider aids. Personally I feel the ABS is a good option to have, the rest I could do without, for casual road riding anyway. 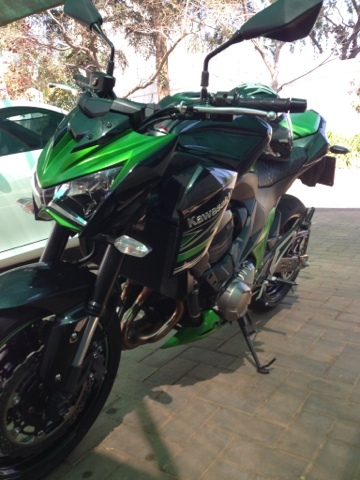 The Z800 has a very subtle suspension set up so comfort comes in abundance, especially on our hard African roads, the flip side is that track warriors may feel a slight disconnect with the bike. I like the set up which is suited to the environment in which the Z was designed to be used. All things considered the Z800 is an awesome bike, there is just one worry which comes in the form of a KTM super duke which, I’m afraid to say, may provide more thrills and after all that’s what a naked bike should do isn’t it?